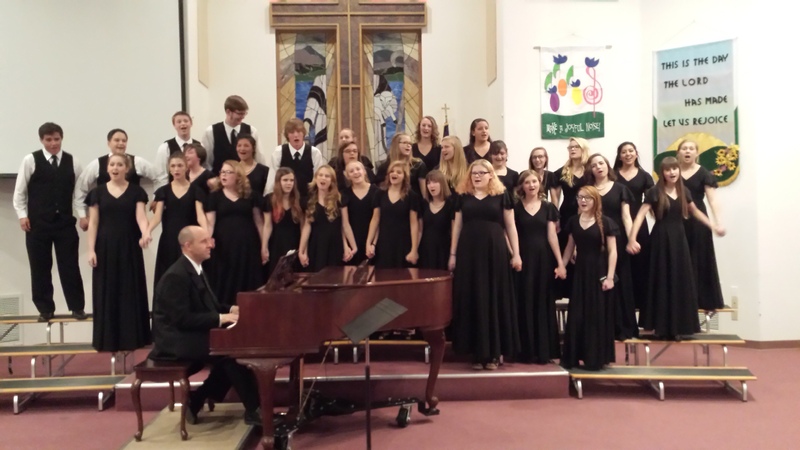 The Chino Valley High School Choir joined us on Friday, February 26, 2016 for two shows (5 pm & 7 pm) for an evening of dessert and song. With the combined effort from church and school, over $6,000 were raised to help send the students to Washington, D.C. for the Veterans Memorial Day Celebration! Pastor Michael Keffer welcomed everyone to the show, then Pastor Wayne Ballard opened the show with a prayer and introduced the choir, led by Dr. M. Dee Wilkins, and accompanied by Glennis Miller. The choir then presented numerous beautiful songs, including solos performed in Italian. And they did it all without music. After which, the students served Cheese cake with various fruit toppings to all the guests. Again the students went back to work clearing the dishes and refreshing the guests drinks. Pizza and salad happened between shows for the Choir. The evenings focus was beautiful music, as well as dessert. In addition to the cheesecake served to the guests, they brought homemade desserts for auction to raise funds. Pastor Wayne Ballard was on hand to act as the auctioneer and lead the guests in a lot of fun. The auction was so successful that they sold out on the homemade desserts and raised a respectable sum for the kids. Kudos to Pastor Ballard for making this part entertaining as well as successful. A silent auction of donated gifts was also helpful towards raising funds. The audience gave the students a rousing-standing ovation at the end of both shows. Throughout the entire evening these young adults displayed exemplary talent as well as a wonderful showing of love and caring for each other, Dr. Wilkins and guests. We at Chino Valley United Methodist Church are grateful for the wonderful evening with which these young adults and Dr. Wilkins honored us. We very much hope to have them back again in the very near future. Click the link above to see a listing of the students in the choir. Click on the photo at the top for a larger view. 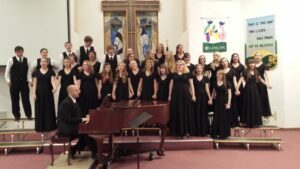 If you would like to donate via gofundme for the choirs trip to Washington, D. C.
Posted in Chino Valley UMC, Events.Tagged CVHS Choir, Events.